In Zener breakdown the electrostatic attraction between the negative electrons and a large positive voltage is so great that it pulls electrons out of their covalent bonds and away from their parent atoms. ie Electrons are transferred from the valence to the conduction band. In this situation the current can still be limited by the limited number of free electrons produced by the applied voltage so it is possible to cause Zener breakdown without damaging the semiconductor. When the P & N regions are heavily doped, direct rupture of covalent bonds takes place because of the strong electric fields. The new hole-electron pairs so created increase the reverse current in a reverse biased PN diode. The increase in current takes place at a constant value of reverse bias typically below 6V for heavily doped diodes. 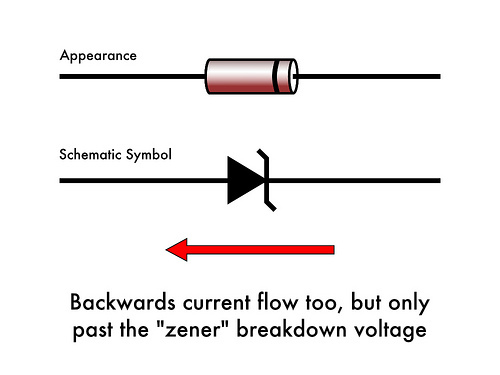 For lightly doped diodes, zener break down voltage becomes high and breakdown is then by Avalanche multiplication. Avalanche breakdown occurs when the applied voltage is so large that electrons that are pulled from their covalent bonds are accelerated to great velocities. These electrons collide with the silicon atoms and knock off more electrons. These electrons are then also accelerated and subsequently collide with other atoms. Each collision produces more electrons which leads to more collisions etc. The current in the semiconductor rapidly increases and the material can quickly be destroyed. As the applied reverse bias increases, the field across the junction increases correspondingly. Thermally generated carriers while traversing the junction acquire a large amount of kinetic energy from this field. As a result the velocity of these carrier increases. These electrons disrupt covalent bonds by colliding with immobile ions and create new hole-electron pairs. These new carriers again acquire sufficient energy from the field and collide with other immobile ions, thereby generating further hole electron pairs. This process is cumulative in nature and results in generation of an avalanche of charge carriers with in a short time. This mechanism of carrier generation is known as Avalanche multiplication. This process results in flow of large amount of current at the same value of reverse bias. Usually the Avalanche Breakdown occurs above 6V. What is War of Currents?